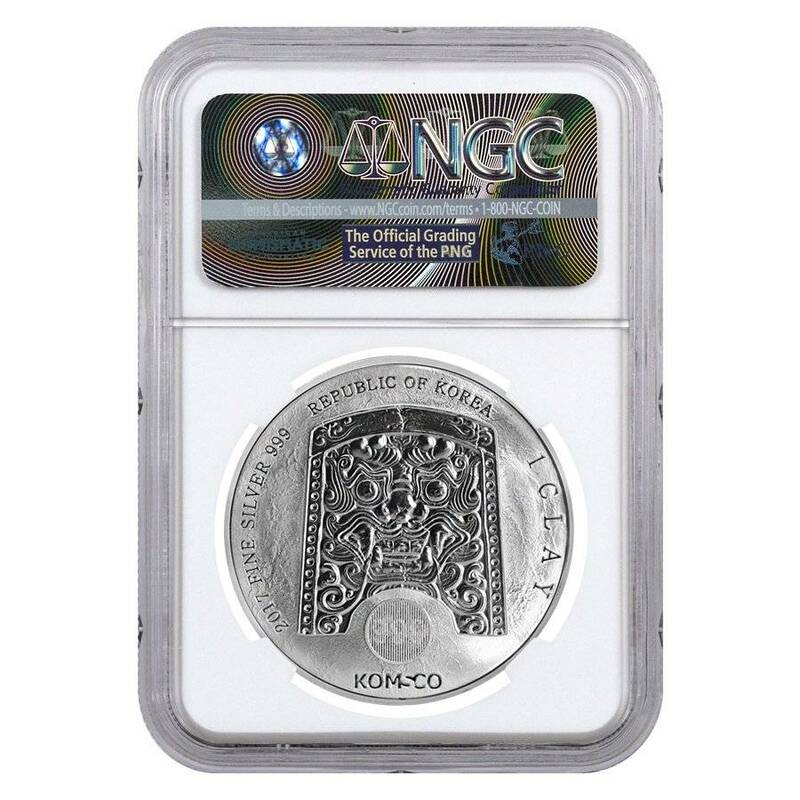 This superb 2017 1 oz South Korea Silver Chiwoo Cheonwang NGC MS 70 Early Releases is the second stunning issue from KOMSCO, the South Korean Mint, displaying the iconic figure of Chiwoo Cheonwang - the Asian God of War. This renowned symbol of the South Korean culture and history, Chiwoo Cheonwang, was the 14th leader of ancient Baedal and considered the God of War in ancient Asian mythology. He is well-known for his demon-like mask showcased as casting magic spells and conveying fear to all enemies which seek war against the nation of South Korea. The mask was also the mascot of Red Devils - the passionate supporters’ club of the national soccer team - during the 2002 World Cup. 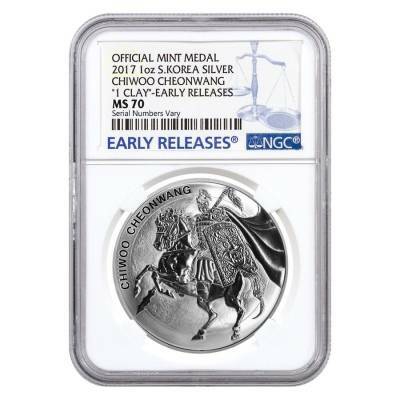 Being the 2nd issue in the Chiwoo Cheonwang silver series from KOMSCO, this spectacular medal displays on its obverse the majestic figure of the God of War, showcased in full armor and wearing his devil-like mask, but this time being engraved as mounted on a warhorse. As an additional anti-counterfeit feature, this wonderful medal also shows up an alternating “Ag”-“999” sign when viewed from distinct angles. 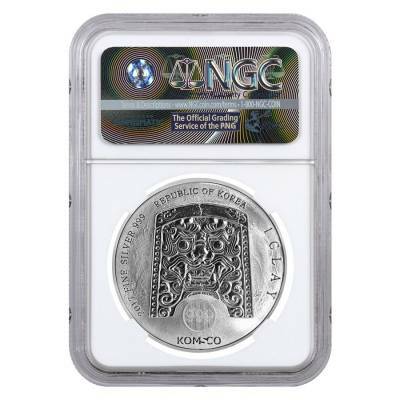 With an exceptionally detailed striking, high silver purity and flawless designation from NGC, this medal is an excellent addition to any bullion portfolio. 2nd release in the Chiwoo Cheonwang silver series. Limited mintage of 50,000 medals. Weight of 1 troy ounce, .999 silver fineness. Minted by the South Korean Mint (KOMSCO). NGC MS 70 Early Releases - Struck with no imperfections noticeable under 5x magnification. Authenticated within the first month of issuance. 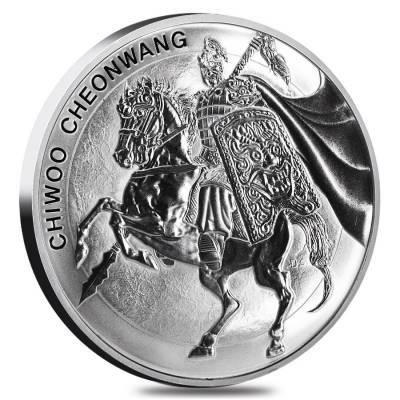 Obverse: Showcases the well-known image of the legendary Korean God of War - Chiwoo Cheonwang - the symbol of victory. He is pictured as a reckless warrior mounted on a horse, wearing his famous mask and full body armor, as well as holding his shield and spear. This image is surrounded by his full name. 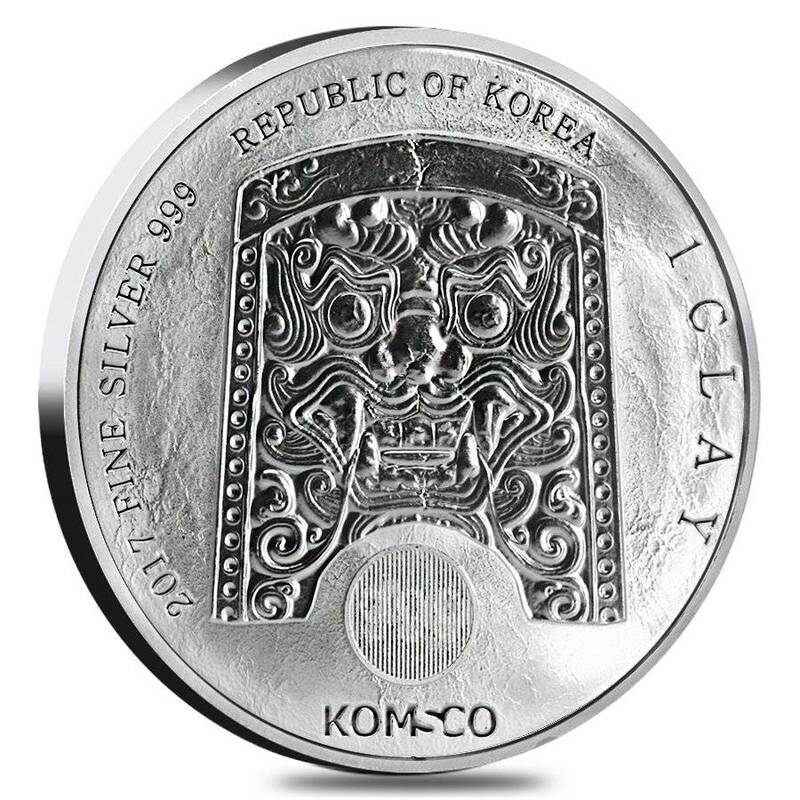 Reverse: Depicts his famous shield which features a close-up view of the “Gwi-myeon-wa” intimidating devil-like mask, framed by the inscriptions of the medal’s weight and purity, with the words “Republic of Korea”, “1 Clay”, and the “KOMSCO” logo. Bullion Exchanges offers you the opportunity to own exclusive certified silver medals of superior quality. Add this splendid 2017 1 oz South Korea Silver Chiwoo Cheonwang NGC MS 70 Early Releases to your collection today, and it will be carefully wrapped, packaged, and delivered to your address. If you have any questions, just call us at 800.852.6884, or send us a message, and we will be happy to assist you. With this purchase, you earn 81 Bullionaire Bucks 81 BB = $0.08. For every $1 spend, you will earn 1 Bullionaire Buck which is equivalent to $0.001 off a future purchase. 81 BB = $0.08.